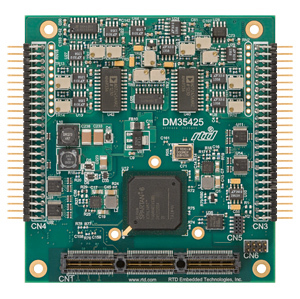 The DM35425HR is a software-configurable high-speed 12-bit data acquisition module in the PCIe/104 format. External connectors provide 16 differential or 32 single-ended analog input channels with programmable gain and input ranges, four 12-bit high-speed analog outputs, and 32 bit-programmable digital I/O with advanced digital interrupts and DMA. The multiplexed A/D input channels permit a maximum sampling rate of 1.25 MSPS, and include optional software-configurable delays as a mechanism to reduce crosstalk between channels during sampling. 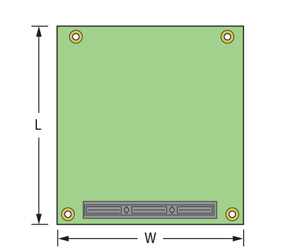 The board is enhanced with an external clocking function block with six direction-configurable clocks, which may be used as sample clocks or triggers to start and stop sampling. Example programs with source code provide a starting point for developing custom applications.